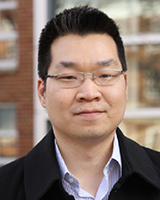 CHESS user Joshua Choi, an assistant professor at the University of Virginia, won a prestigious NASA Early Career Faculty Award for his project “Lightweight and Flexible Metal Halide Perovskite Thin Films for High Temperature Solar Cells”. Josh and his students have already performed first x-ray scattering experiments related to this project at D1 station in the summer run 2015. The NASA Program aims to support “early stage technologies that will address high-priority needs of America's space program” (see NASA Press Release). Eight projects were selected out of a national competition which will be funded for $200K per year up to three years. We congratulate Josh and are looking forward to more exciting experiments of his group at CHESS!